That the little boy loved Uncle Remus and his stories was so obvious that the tale-spinning sessions began drawing additional listeners. Daddy Jack, an old "Africa man" visiting from down-state; Sis Tempy, the strong chief of the mansion's servants; and Tildy, a young and pretty servant-girl - all found their way to Uncle Remus' rude cabin when their duties or interests permitted, to sit around the hearth and hear the wonderful tales of the animals, and foremost among them, Brer Rabbit and Brer Fox. It turned out that some of the tales had different ways of telling, and the visitors took their turns at being the story-teller. Always one or more clever animals humbled or hornswoggled others among their community with flattery, wide-eyed mystery, or outright fraud. 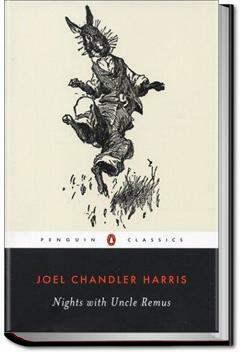 After the success of Harris' "Uncle Remus: His Songs and His Sayings", he went on to write eight more books compiling the tales he himself had heard on the plantation in his young days. This is the first of those sequels. . . .He git de paw in, en den he beg fer ter git de yuther paw in, en den w'en he git dat in he beg fer ter git he head in, en den w'en he git he head in, en he paws in, co'se all he got ter do is ter shove de do' open en walk right in; en w'en marters stan' dat way, 't wa'n't long 'fo' he done make fresh meat er Speckle Pig. "Nex' day, he make way wid Blunt, en de day atter, he 'low dat he make a pass at Runt. Now, den, right dar whar ole Brer Wolf slip up at. He lak some folks w'at I knows. He'd 'a' bin mighty smart, ef he had n't er bin too smart. Runt wuz de littles' one er de whole gang, yit all de same news done got out dat she 'uz pestered wid sense like grown folks. I know. It's a classic. It's also completely unreadable. I know it was written in a different time (but not a different place: I live in Georgia), but honestly. Nobody talks like that.